Comedy is BACK in the East Bay for 2018! 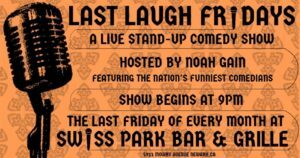 Join us the Last Friday of every month at 9pm for a night of live stand-up comedy for FREE at Swiss Park Bar & Grille! The show features some of California’s best and funniest up and coming comedians, including comics who have appeared in clubs and on television, such as Comedy Central, FOX, NBC and more. Come out to a show that has no cover and no annoying drink minimums; just hilarious comedians ready to make you laugh! Seats fill up fast, so reserve your FREE seats today by e-mailing noahgaincomedy@gmail.com, and give our “Last Laugh Fridays: Live Stand-Up Comedy” page on Facebook a like! We look forward to making you laugh!